The toothpaste you are using may be wearing away the enamel on your teeth! The grit in toothpaste is effective at removing stain and plaque however is abrasive for tooth structure. There is an abrasive index for toothpastes called the RDA Index. The higher the value, the more abrasive it is. At or below 45 may be an acceptable balance between benefit and risk if you must use toothpaste. Over 45 is a matter of how quickly the loss of tooth structure can occur based on the RDA, frequency of use, type of toothbrush, and brushing technique. The most ideal approach would to NOT use toothpaste but rather dip your brush into a mouthwash. The next best alternative would be to use only toothpowders or gels, which are typically less abrasive. If you don’t know the RDA of your toothpaste, you can find out by using the consumer information on the package or container. 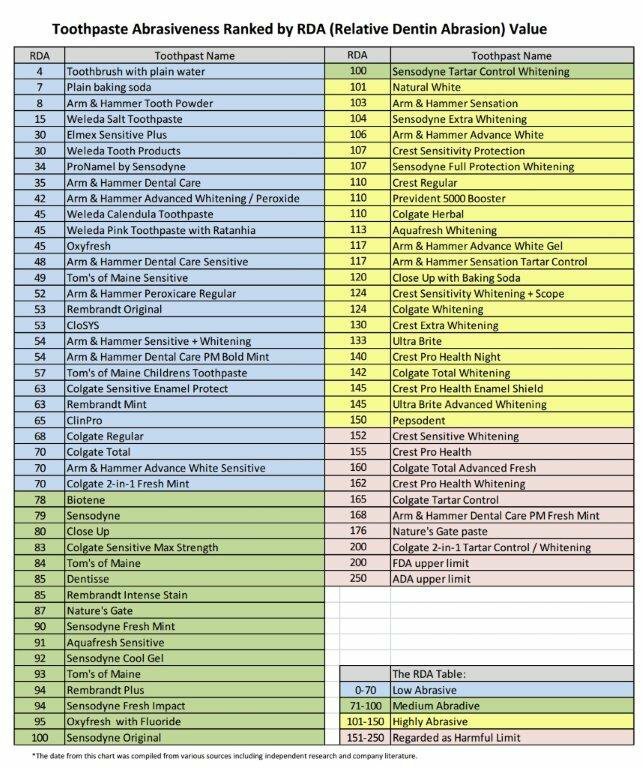 The following list gives the RDA index of just some of many toothpastes that exist today.